This weekend was a bit of a blur really. Friday night I went to see the movie The Lake House (not my choice). I was pleasantly surprised by how much I actually liked it (review to come soon). Snicker if you will. The movie was followed by a Thai dinner which allowed for plenty of left overs. Saturday I worked a half day, it's all about the OT. After work I headed to Fairhaven where our local indie bookseller, Village Books, was having their bi yearly sale. I splurged and spent about $80 on the following: The Nasty Bits by Anthony Bourdain, Saucepans & the Single Girl by Jinx Morgan and Judy Perry, Color : A Natural History of the Palette by Victoria Finally, and finally I stumbled upon One Special Summer by Jacqueline and Lee Bouvier (at $35 the rather thin book seems a bit overpriced but I just had to have it). Then I met my friend Sara and her husband to go wedding present shopping for our friend Mike's upcoming nuptials. After the presents were purchased we spent the rest of the evening sipping pink cocktails while forcing Sara's husband to watch AND enjoy Bridget Jones's Diary with us. Sunday morning I got together for a visit with some of the family over brunch at Anthony's in Edmonds. It was my Mom and I, my Aunt, my two sisters Kat (the step sister) and Heidi (the half sister) and Kat's fiance. After brunch, my Mom and I headed to downtown Seattle. I was searching for the perfect wedding outfit, which I luckily located easily enough. Then at Nordstrom I had a bit of a break down when the man at the Chanel counter informed me that MY lipstick (metal garnet) had been discontinued! Luckily he was a dear and called around to other Nordstrom stores across the country to locate one more tube for me. But now I'm on the search for a new perfect lipstick because how long can I realistically make one tube last. After leaving downtown we drove to Woodinville to see Elvis Costello perform at an outdoor concert at the Chateau Ste. Michelle Winery. We've been having a bit of a heat wave these past few days so although the show started at 7:00pm it was still extremely warm out. The concert was swell and Elvis turned out to be quite the talker. What's great about attending a show at a winery is that the wine is flowing and the food is spectacular (blackened salmon on top of a caesar salad). I definitely want to try to attend another concert at the Chateau before summer ends. Then it was home by 10:30pm and up this morning at 6:00am for work. Happy 2nd day of summer! 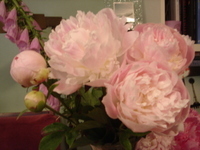 These bouquets of pink peonies were given to me by my very generous neighbors. 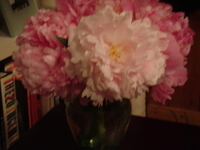 Saving me the $3 a bloom I almost paid at the flower shop. Speaking of the generosity of people, the very kind Lauren, of Lux Lotus, sent me two books she's currently working on. The books are: Triangle by Katharine Weber and Instant Love by Jami Attenberg (isn't the cover just divine?). Thank so much Lauren! These books are now at the top of my summer reading stack. I decided to start a second blog devoted to all things Savannah, titled "Georgia On My Mind". In this second blog I'll post about preparing to move to Savannah, life in Savannah, and of course Savannah College of Art and Design. If you are at all interested in any of these topics then feel free to check out Georgia On My Mind for yourself. Sykes picks up where the prospective-husband hunters of her bestselling 2004 debut, Bergdorf Blondes, left off: "Married girls in New York these days put almost as much effort into losing husbands as they once did into finding them." 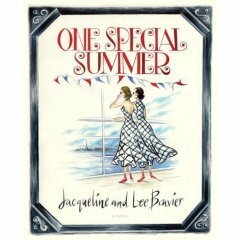 When Sylvie Mortimer's husband, Hunter, gets called away for business on the second day of their Mexican honeymoon, Sylvie meets fellow Manhattanite Lauren Blount, in town for her divorce honeymoon, and Lauren takes the abandoned newlywed under her wing. Back in New York, Sylvie, working on the cheap for fashion designer friend Thackeray Johnston, brings a grounded perspective to Lauren's world of the rich, well-connected and freshly single, a world of theme parties (divorce showers, power christenings) and modest goals (make out with five men before Memorial Day, hook up their own surround sound). Meanwhile, Hunter's blossoming career as a television producer makes him a prime target for "husband huntresses," including his notorious co-worker Sophia D'Arlan. With Hunter acting secretive, Sophia popping up everywhere and Lauren egging her on, Sylvie sees her own divorce shower in the works. If you're looking for a quick, amusing beach read then The Debutante Divorcee might be just what you need. Weekend Recap: Went home sick Friday at noon but was able to pull myself together to attend opening night of the film A Prairie Home Companion. It is a lovely film that will bring you to laughter and tears. The over sixty set, who we sat among, agreed that the film was a success. They proved this by breaking out into raucous clapping once the credits started rolling. We viewed the film at a small film house called The Pickford Cinema (named after Mary Pickford). They have a drawing every evening for a free pint of Mallards Ice Cream. Mallards is a spectacular local ice cream shop that makes their own ice cream and offers specialized flavors like Rose and Cinnamon. And we ended up winning the free pint. So I headed home with a container of Mallards cookies and cream (boring, I know). On Saturday I was invited to a neighbors dinner party. They hired the chef of the Mount Bakery (a local slow food restaurant) to cater the party. The weather was a bit unpredictable in the morning but luckily the sun came out long enough to eat outside. The chef is from Belgium, 32 years old, cute but married. We started off the evening with olives, bread and delicious cheeses with quince spread, salami and prosciutto. Dinner was lamb, wild rice, and asparagus. Then we ended the evening with flourless chocolate cake topped with raspberries and mini creme brulee. 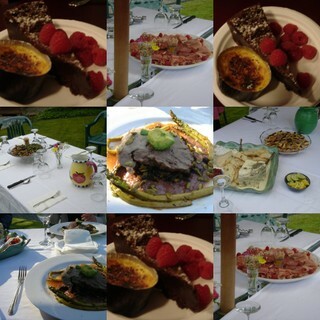 It was all delicious and I'm very keen on the whole intimate catered dinner party. Here's hoping I get invited to a few more this summer. As a side note: today is my Mother's Birthday. So Happy Birthday Mom!